Mackie, RA , Photograph of Rachel Anne Mackie (nee May), Tasmania , University of Tasmania Library Special and Rare Materials Collection, Australia. 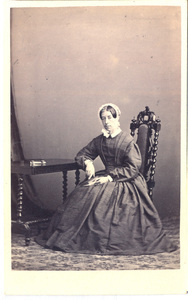 Photograph of Rachel Anne Mackie (nee May) wife of Frederick Mackie, Tasmania. Both came from South Australia. The photographer was Charles Alfred Woolley who had studios at 42 Macquarie Street, Hobart from 1860-1870. Tasmanian photographers 1840-1940 : a directory / by Chris Long ; edited by Gillian Winter. Tasmanian Historical Research Association : Tasmanian Museum and Art Gallery, 1995.